Four people are hurt in an explosion at the Letterkenny Army Depot in Franklin County, Pennsylvania Thursday. A small explosion Thursday in a vehicle shop at an Army depot injured five workers, three of them seriously, officials said. The blast occurred at Letterkenny Army Depot in Chambersburg about 7:15 a.m., causing a small fire, said Col. Stephen Ledbetter, the depot commander. 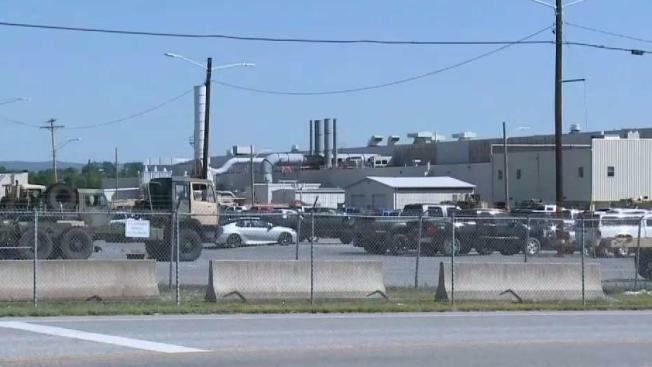 Army Depot officials quickly posted on social media the incident was contained, that operations elsewhere on the base would not be affected and that there was no suspicion of terrorist activity. Ledbetter said three victims were flown to Baltimore-area hospitals with what he described as serious injuries. Their conditions were not immediately known. Fire officials said they suffered burns. Ledbetter declined to discuss their injuries. The two other victims were treated at a local hospital and released, at least one for smoke inhalation, depot officials said late Thursday, updating the total number of those injured. Ledbetter said the explosion occurred in the painting area of a vehicle shop where more than 300 people work. He said the building does not hold any munitions. Both the Army and the Occupational Safety and Health Administration will investigate, he said. Sen. Pat Toomey of Pennsylvania said on Twitter has was monitoring the situation. "My staff and I have been in contact with the @USArmy and are awaiting more information. My thoughts are with those who are injured, their families, and the entire Letterkenny community," Toomey tweeted. The depot, located 160 miles west of Philadelphia, or about 55 miles southwest of Harrisburg, employs about 3,600 people. The depot's website says work there focuses on air defense tactical missile ground support equipment, mobile electric power generation equipment, Patriot missile recertification and route guidance vehicles. The facility posted a message to employees on its Facebook page: "please do not post or share any information regarding the incident at 350 on Facebook or with any media outlets. Thank you."